Navigation is the essential skill for all who aspire to travel in the hills safely in all seasons and conditions. Navigation exercises are fun and a great way to spend wet days on the hills. measuring distances by pacing and with the aid of a a stop watch. 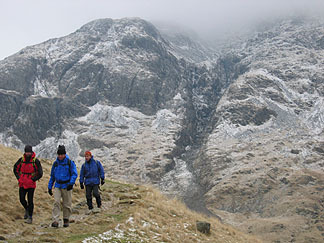 Our navigation courses are held within the Lake District. Our navigation courses have low fitness requirements, although we will be walking on various types of terrain under conditions ranging from sun to fog to rain or snow. No previous navigation experience is required. transport to and from the course location (but see specific courses and holidays for exclusions - e.g. airfares). Descending into Wasdale - at least that was the plan!